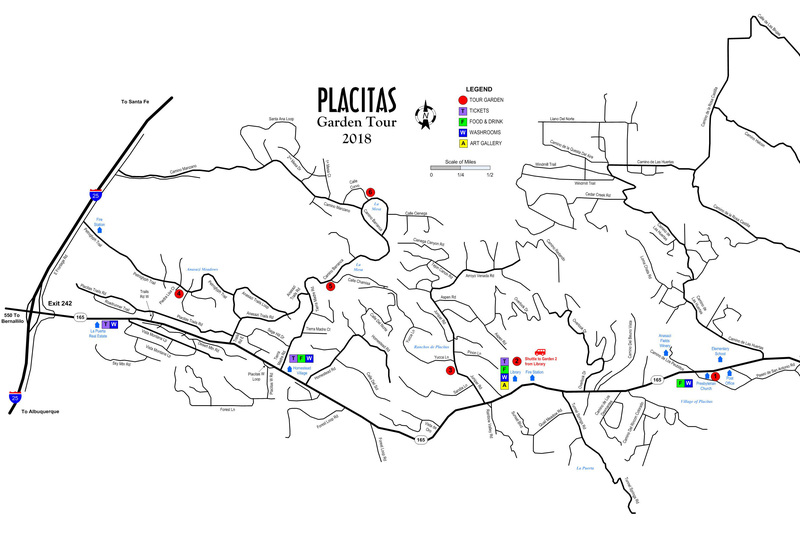 All the gardens on the Placitas Garden Tour for 2018 are located near the village of Placitas. A brochure (which will include a map with locations of the individual gardens) will be given as a ticket to each tour visitor. The brochures may be purchased on the day of the tour at La Puerta Real Estate, the Homestead Village Shopping Center, or the Placitas Community Library. Food and beverage locations, restroom facilities, information and ticketing tables will be designated in the brochure and are shown on the map below (click on the map to view a larger version). In addition to the map there will be signs with the logo shown below directing visitors to each of the gardens on the tour. Some GPS systems work poorly in Placitas. We recommend using the map and following the signs to find the gardens.